My buddy, Nick talked me into runnning a race on Friday nite. I ran it last year and had a great time, so what the heck. I drove out to Higley High while I watched the lightning in the distance. It's a fundraiser for the high school CC team with a half lap on the track, then an out and back along the canal, all at night and for the second year in a row, in the rain. They had to shorten the course to around 3 miles. We still had a fun time. Nick was the fastest of our group. His wife Susie was second and I brought up the rear. I thought I as going to run around a 12 minute mile or worse. I was closer to 11, so it was a good nite. Far from my personal best, but not bad for a first race after the ankle injury. I got to meet the owners of gypsyrunner.com. And bought a couple things too. They have some great decals for your car. Check them out. At the half way point you turn back and see the stadium lights. It was raining lightly at this time. Loved the shirt I got and the carplate I bought. Ankle feels fine and I'm ready to do a long run on Sunday. I got in 4.6 miles tonite running past the pee wee football players. I see them and I daydream about my football playing days. I tend to run better when I let my mind wander, daydream and make up heroic stories with me as the hero. I'm still doing a run/walk program as you see in the graph. But, tonight I was having fun getting the run portion down into the 8's and 9's. I even saw a 7:21 on my garmin. If only I could run that fast for more than a 1/10 of a mile. I'm really happy with the improvement I've seen since the beginning of the month. I ran about 64 miles total in May, June and July because of my ankle. I'm at 57 miles in August and hope to get 100 miles for the month. Tonights run was the fourth day in a row. It was going to be a short easy run to the park and back with a short break to look for a geocache at Desert Breeze. I can use my forerunner 305 to locate the cache. No luck finding it. Darkness had desended on the park, so after looking around the picnic ramadas for about 10 minutes, I headed home. 3 miles tonight game me 18.5 for the last four days. Maybe I can find a cache during the marathon up in Minnesota. How far can I go in Minnesota? I'm getting my mileage in at a walk/run type pace. Last week it was 18 miles and this week I have 9 already (Monday-Sunday). So, when I run I think about the Twin Cities Marathon course. 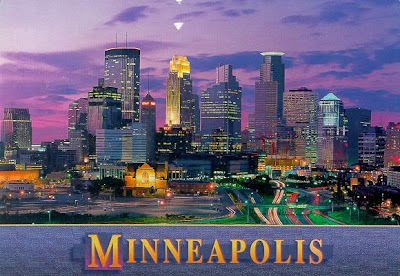 The first 2-3 miles head west out of downtown Minneapolis and up a hill to a chain of lakes. It takes me that long to get to my running lake, Desert Breeze. Then the next 5 or 6 miles is along the lakes, so I do a few laps around my lake. From 8 to 15 in Minnesota takes you to Minnehaha Falls, a scenic park near the Mississippi River. These days, as I run I try to picture what that run is going to be like. Now, I'm way behind in training due to my ankle. So, my mind wanders to how far I can actually run on Oct 4. I doubt I'll be ready for a full marathon by then. But, it's all paid for, so I will run as far as I can. At the Minnihaha Falls (yes, it's really called that) there is a light rail station. I can run 15 miles and then skip the rest, take the rail to my hotel, pick up my baseball tickets and go the last game at the Metro Dome. Or I can go to the 19 mile marker and I'll only be a couple miles away from downtown. The last 7 miles heads away from Minneapolis to downtown St. Paul. I even thought about sleeping in and taking the rail to the 15 mile mark and start my run from their. Of course, I would not run thru the finish line nor collect any hardware or a finisher's shirt. I'm going to enjoy the experience, but not cheat. Most likely, I will run the first half of the race and then determine how I feel as I run. Hopefully, the cooler temps and the crowds will help me to run further. Less than 8 weeks to go. I put off the Xray because my ankle was feeling better. But, not 100%. Finally, I talked to the nurse practioner and she arrange for an Xray, which I had on July 14th. The conclusion: "Lateral soft tissue swelling and possible tiny avulsion distal fibula." Recommended therapy: Rest and Ice. I can do that. So I've rested. Iced. And started power walking, advancing into easy runs. That's been my summer. I've missed several races, but slowly I'm getting better. I'm way behind on my marathon training. Do you think the Twin Cities Marathon will postpone the race until I'm able to do it?